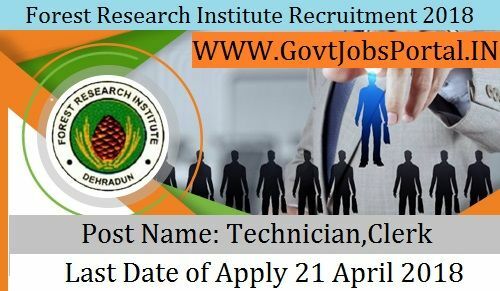 Forest Research Institute open new vacancies for Indian Candidates. Forest Research Institute official published this new recruitment in the Employment News paper as well as on their official website .Interested and eligible candidates can have online application scheduled from 21-April-2018 Online can be registered online on the official site, all candidates are requested to submit all necessary employment related information before applying for this government job. Total numbers of vacancies are 156 Post. Only those candidates are eligible who have passed 12th Pass and Typing speed of 35 wpm in English OR 30 wpm in Hindi & Matriculation and ITI Certificate in relevant Trades. We advise all the interested and eligible candidates to read the whole criteria carefully below before applying for these GOVERNMENT JOBS in India. We personally split this article into various section below, so that candidates easily understand all the term and condition related to these Government Jobs in India. These various sections contains Eligibility Criteria, Selection process, Process for applying and Important links. We advise you all to go through these all section before applying for these Govt jobs in India. Academic Profile: Only those candidates are eligible who have passed 12th Pass and Typing speed of 35 wpm in English OR 30 wpm in Hindi & Matriculation and ITI Certificate in relevant Trades. Nationality Profile: All Indian Candidates who meets with the education and age creteria can apply for these Government jobs in India. Age Criteria: The Contestants applying for the post should be existing between 18 & 30 Years. Indian candidates who are wishing to apply these Govt jobs and meet with the SECTION:1 Criteria which we explain above have to go through the following selection process which we explain below step wise. There will be various round of selection under this FRI recruitment process. Candidates have to clear all these rounds of selection to get qualified for this Government job under FRI department. 1: The first round of selection will be the Written exam. 2: Those who get qualified through the first round of selection will have to appear in the second round of exam. This exam is know as the Skill . Now the last question which comes under our mind is that how to apply these Government jobs ? There is no other way to apply these Government jobs. Below we also share the direct official link to apply. Thank you for reading this post. We will share more continue your visit with http://www.govtjobsportal.in .